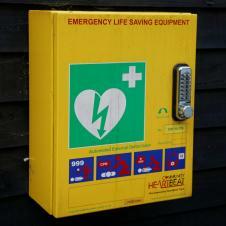 Our defibrillator is housed in the old telephone box on the Village Green. If needed, just dial 999 and you will be guided through the process of how to use it by the Emergency Services. If you should become aware at any time that there is a problem with the Defibrillator, for example, there are signs of vandalism, please contact the Parish Clerk immediately.